Hello! It's day 2 of sneak peeks from Paper and Such. Meet Johnny, he's the next in line from the exclusive "Hot Shots" line available only at the Paper and Such on the 9th. I found this cute little fish button in my stash and couldn't resist using it. Make sure to stop by and see what the rest of the DT has created. Don't forget to comment along the way, one lucky winner will win the entire Oct release! So the more you comment the better your chances. Winner will be announced on the 10th on the Paper and Such Blog. Thanks for stopping by and see you again soon! Love your twine treatment. Too cool. Also love your fish. Too fun. You know, I bet we could make him look like an aviator with those glasses! This is SUPER cute! 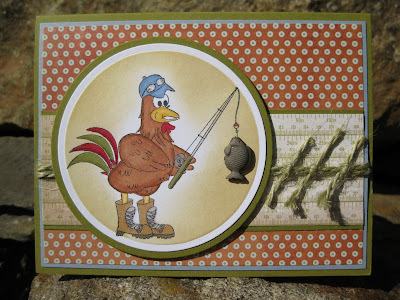 LOVE the twine and that fish button! Johnny is quite the cutie, too! Johnny is very cute as is your card! The fish button is the perfect embellie! The fish button is inspired! Super Cute.... kind of looks like Julie's brother... LOL! i like i like ! Great card....I love the fish button, very effective. This is so cute - love how you added the fish button and your beautiful sponging! He is just adorable! Love that fish too! Adorable! Love your coloring and paper choice, and that twine is the perfect finishing touch!